The Oilholic joined the great and good of the oil and gas business at the 2017 International Petroleum Week being held in London, with the question on everyone's mind - will OPEC and its new found 11 non-OPEC pals extend their agreed production cuts - in place until the summer - beyond June? Opec Secretary General Mohammed Sanusi Barkindo promised a "high" level of compliance with the cuts, and dismissed the sceptics. Later in the week, Qatari Energy Minister Mohammed Bin Saleh Al Sada, in town to collect his gong as the 'International Energy Diplomat of the Year', hinted that OPEC could indeed extend the cuts beyond the summer by suggesting the oil market might not rebalance before the third quarter of the year. Although, the minister did attach a caveat, claiming it was "premature" to indulge in chatter about what may or may not happen in the summer. Who knows for now, but as the oil price is stuck in the $50s and is going nowhere fast, many of the long bets are indeed predicated on OPEC extending its cuts for another three months beyond June. Away from the 'will they, won't they' of producers, yours truly was also delighted debate the level of transformation Arab National Oil Companies are likely to undergo over the coming years at an IPWeek debate, organised by our old friends at Gulf Intelligence. With the industry on the cusp of profound change, it is worth watching this space. However, it will take time. That's all for the moment folks. Next major event on the horizon - IHS CERAWeek in Houston, Texas. Keep reading, keep it 'crude'! © Gaurav Sharma 2017. 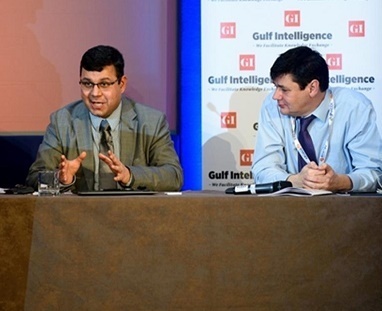 Photo: Gaurav Sharma (left) with Paul Young of the Dubai Mercantile Exchange at the International Petroleum Week 2017, GI debate on transformation of Arab NOCs, February 22, 2017 © Gulf Intelligence.